We’ve been experiencing a bit of a heat wave here in Southern California. Not exactly feeling like winter when it’s too warm to wear sweaters and boots. It was noted that my hometown was the hottest place in the country last week (take that Florida!) and I for one am eager for things to cool down. Christmas didn’t quite feel like Christmas with the warm Santa Ana winds rattling through the house making it necessary to run the air conditioner all day. Nevertheless, this weather makes for perfect exploring and that’s just what Karen and I did this past weekend. When we drove up to Santa Cruz to visit Rose in September, part of our journey included passing through Santa Barbara’s wine country. It was there that we decided we needed to plan a weekend and come back for some tastings, our own PG-version of Sideways, which we had every intention of watching the night before, but we were so busy chatting and scouring for discounts on Groupon that we didn’t get around to it. 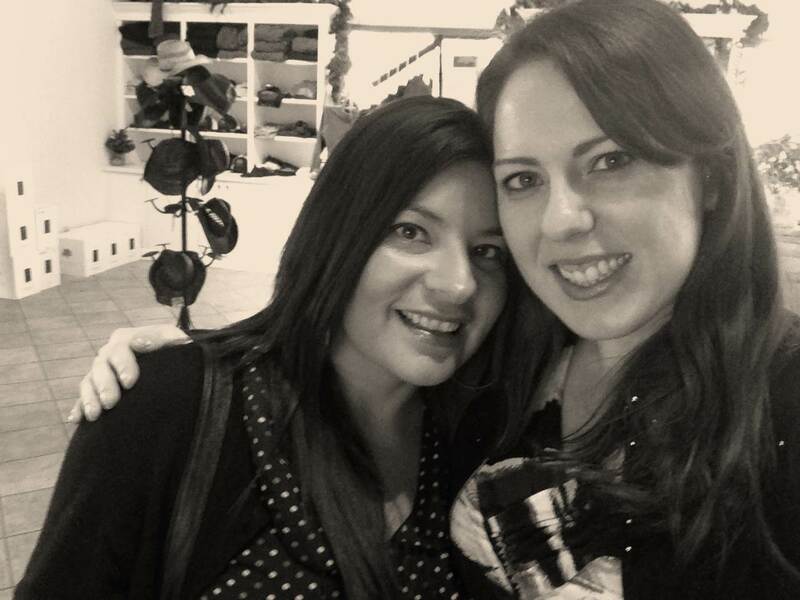 Nevertheless, after a breakfast of eggs and bacon made by yours truly, we settled on Los Olivos with Groupons for two tastings and the planless plan to just see where the day took us. Our first stop was the eclectic Artiste Tasting Studio tucked away off the main street in Los Olivos. As soon as we walked in, we were blown away by how different this tasting room was from any other we had ever seen. 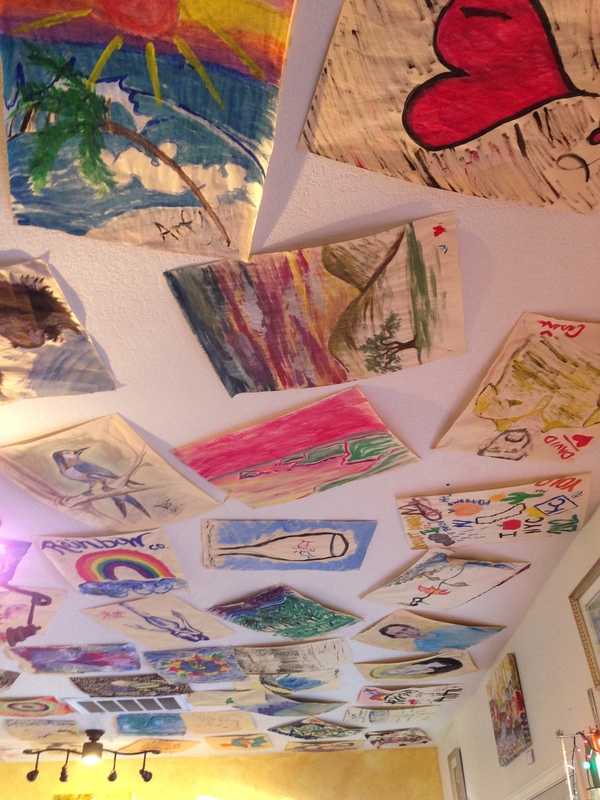 The ceiling was covered with pieces of art made by patrons of the establishment and there were handmade crafts, including jewelry and the most interesting tea light wine stoppers we had ever seen, for sale along with the bottles of wine. Each of the bottles had wax seals giving them a little something extra. We were greeted by a friendly sommelier named Robert, who seemed as knowledgeable about food as he was about wine. 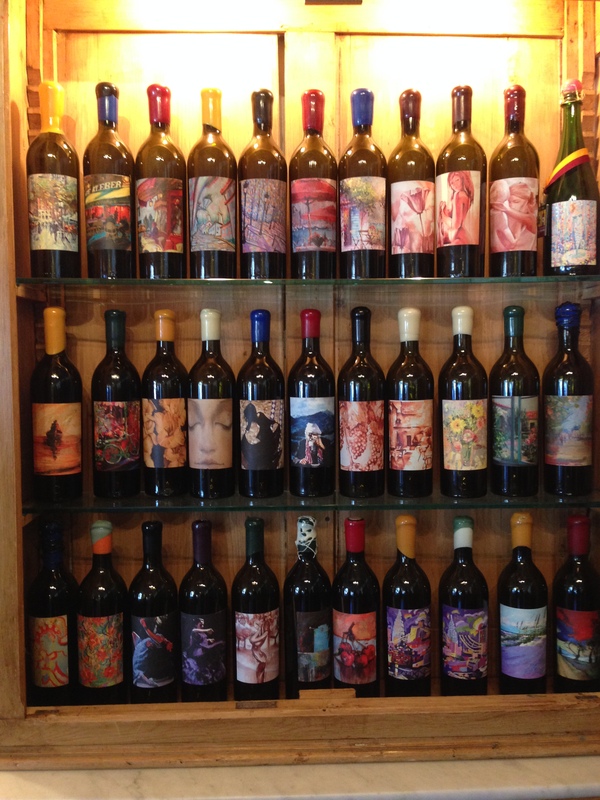 As we tasted from bottles with names like Automne and Chaise Bleue, we learned that the wine blends were designed around the artwork that was placed on their bottle. The Café de Flore was meant to evoke the feeling of sitting at a French café, snacking on baquettes and pastries watching the world go by on a Parisian day. In total, we sampled six different reds—my personal favorite was the Sunset Breeze)—and Karen took home the Retreat with her Groupon. 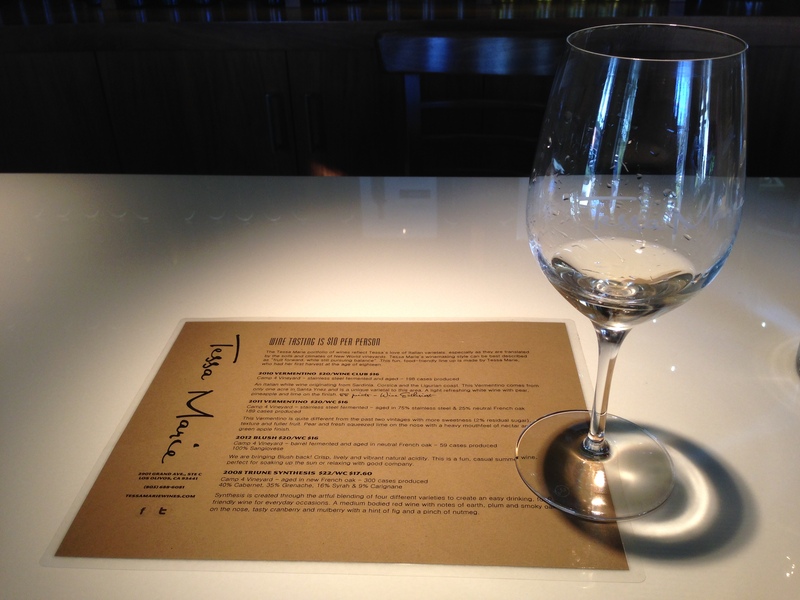 On Robert’s recommendation for some delicious white wines, we headed down to the Tessa Marie tasting room. The small room was completely different from the first tasting room. With a modern feel, the lighting and artwork were simplistically elegant and the only real sense of personality was an adorable framed photo of the owner’s young son sitting amongst the grapes. Though I didn’t get her name, the sommelier treated us like we were old friends with a familiarity that is too hard to fake. We sat and sipped Vermentino, Blush, and the signature Sangiovese never feeling like we had to rush. With the beautiful light shining through the windows, we took pictures and marvelled about how fast our day was going. In the end, I bought a bottle of the 2011 Vermentino, so wildly different from the 2010 Vermentino. I can’t wait to have a nice evening with friends to share it with. 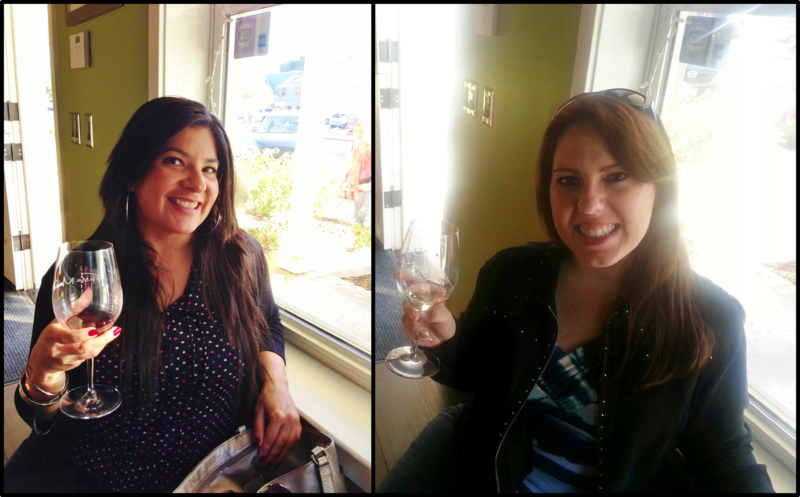 Our other Groupon took us to Beckmen Vineyards about a mile away from the main street. This was the only tasting we had on the vineyard where the grapes are grown. We drove down the very narrow road, passing rows and rows of empty grapevines to get to the tasting room. Unlike the smaller tasting rooms, Beckmen was crowded and had a very commercial feel to it with a small gift shop near the tasting area. Once we could finally push make our way to the bar, we found that we could choose from the Groupon tasting or upgrade to the fancier selection of wines. We stuck with what we had already purchased and soon we were sampling biodynamic Syrah, Cabernet Sauvignon, and Grenache while a cat named Mona Lisa made her way through the crowd to lay on the patio. I don’t know if it was because the room was crowded, that it was close to closing time, or that we weren’t members of the wine club, but the service at Beckmen left a little something to be desired. We felt like we were a bother to the sommeliers who poured our samples, some not even giving us any information about the wine we were about to drink. The whole tasting felt a little half-assed. With our Groupon, we left with two logo glasses and a bottle of the 2011 Cuvee le Bec, luckily my favorite of the wines we tried. Karen is responsible for this gorgeous photo. Now, we didn’t make it in time to do a wine tasting, but I just had to show Karen this vineyard. Five years ago, my darling sister and her wonderful husband started their family on a warm May afternoon. I hadn’t been back to the vineyard since the wedding, but it was just as beautiful as I remembered. 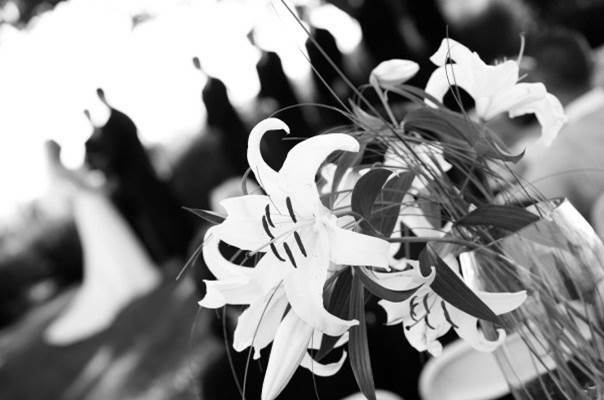 I found myself transported back to that wonderful day: the parking lot where I let the flower girl sniff my bouquet, the grassy hill where I watched a squirrel poke around during the vows, the picnic area that had been transformed into a dance floor for the reception. The memories poured through my mind just as the wine had poured through our glasses earlier. It’s so hard to believe that it’s been almost six years since this happy day. We drove home talking about all the fun we had shared, the wines we had tried, and how we couldn’t wait to do another wine weekend. And then we watched Sideways. It really was a great day, Caitlin. I love Massachusetts! What part of the state do you live in? I have a ton of family in the Boston area (Norwood, Somerville, Framingham, Watertown, and Belmont) and I make it out there every year, usually in March. I look at it as my one chance to experience a real winter. 🙂 I love that you guys actually have seasons! It’s something pretty unheard of around here, though it was down to 42 degrees on my drive this morning with a high expected of 70. I tell ya, this weather is weird! That is the good thing about season… they’re over just as you’re getting sick of ’em. I hopped over here from Amber’s blog The Usual Bliss to check out your blog. 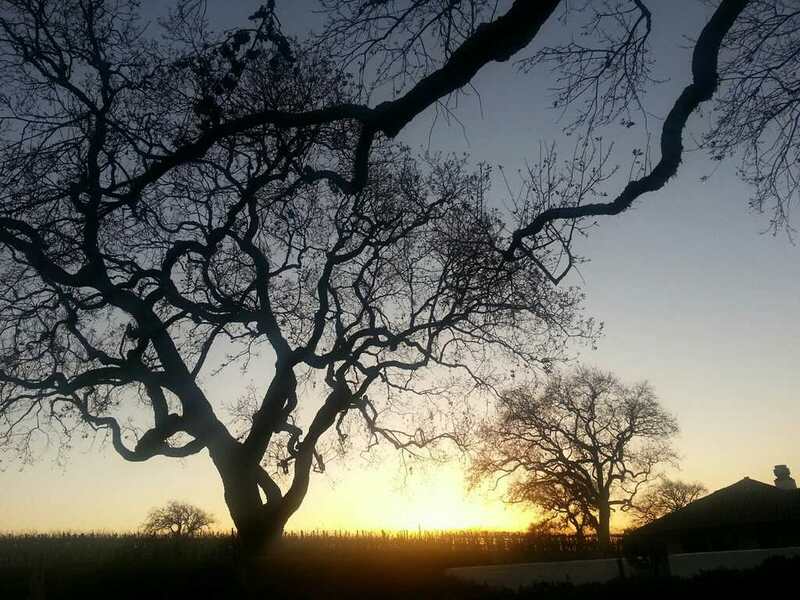 Great Post – love exploring CA Wine Regions – have yet to check this area out:) Happy New Year!!! Well, thanks for stopping by! Don’t you just love Amber’s blog? She has some of the most beautiful scenery around and some great, bliss-filled posts. If you ever get the chance to check out the Santa Barbara wine country, I highly recommend it. A lot of the vineyards have reasonably priced wine and for the most part, the folks are wonderful to talk to. We stayed at Artiste long after our tasting talking to the sommeliers about food, wine, and art. It was a blast. 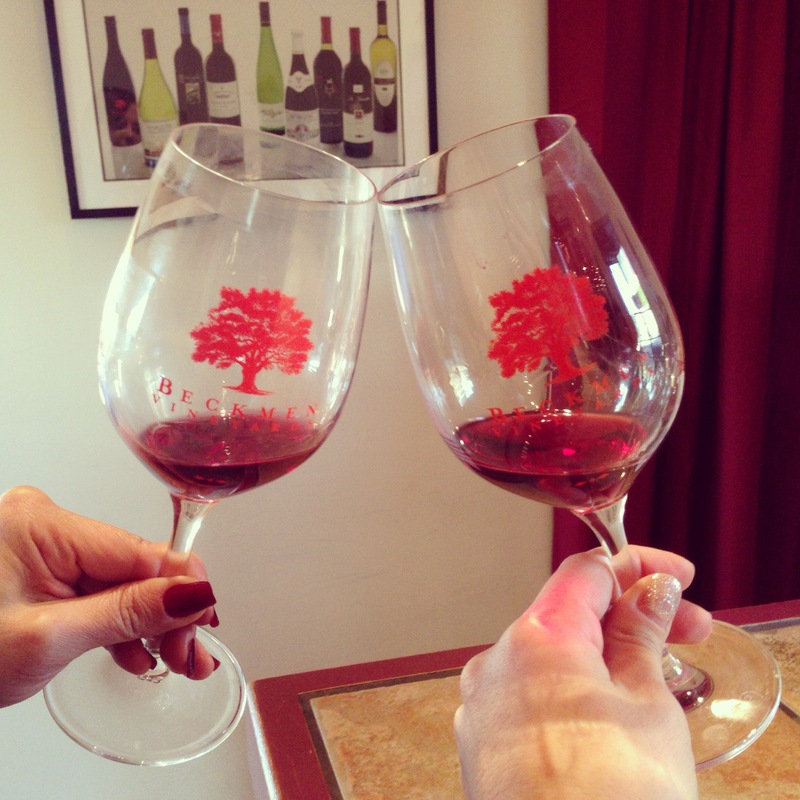 I have been to Santa Barbara Wine Country, but have many more wineries to get to – ha! I am putting Artiste on my list for my next visit to the area. I’m with you… there are SO many wineries and tasting rooms to visit. Artiste is definitely a tasting room that shouldn’t be missed though and everyone who worked there treated us like old friends passing through.